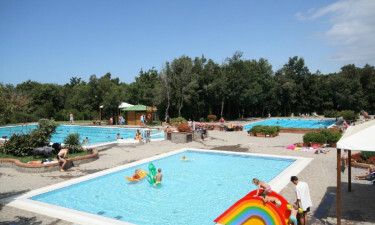 Camping Montescudaio is a luxury camping site in the Province of Pisa, in the Italian region of Tuscany. The holiday camping site offers superior mobile home accommodation, set in 17 hectares of coastal pine forest, but just 2½ miles from the Estrucan Coast and the clear, blue waters of the Tyrrhenian Sea. Camping Montescudaio is renowned for its cleanliness and attention to detail, which sets it apart from lesser camping holiday sites. If you have any questions about luxury camping in Italy, or would like to make a booking, contact the experienced international sales team at LUX-Camp today. 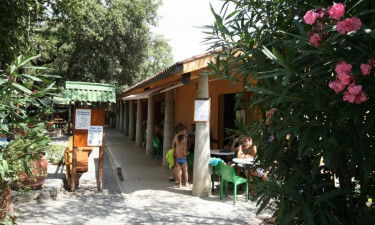 Why should I camp at Camping Montescudaio? Mobile home accommodation at Camping Montescudaio is available in various shapes and sizes, suitable for between 4 and 7 people. Accommodation includes hot and cold running water, air conditioning and a fully equipped kitchen area with a conventional cooker, a microwave oven and refrigerator. Of course, luxury camping also includes a bathroom with lavatory, shower and washbasin, but Camping Montescudaio also throws in a few bonus items, such as a barbecue and a beach umbrella, at no extra charge. 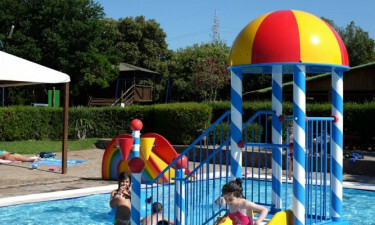 Camping Montescudaio offers all the basic facilities that you’d expect from a holiday camping site, including free Wi-Fi and coin-operated laundry facilities. Sports facilities include bicycle rental, a children’s playground and opportunities for basketball, five-a-side football and volleyball on well-maintained courts and pitches. The luxury camping site also offers a comprehensive programme of entertainment for adults and children, organised by skilled professionals. Camping Montescudaio enjoys a prestigious location, not far from some of the most beautiful countryside in Tuscany. 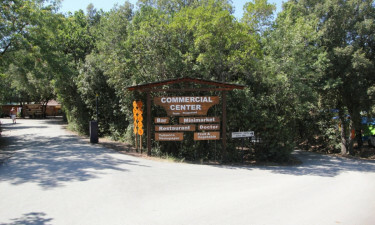 The Parco Naturale della Maremma, or Natural Park of Maremma, for example, was the first of its kind in the region. The park covers 9,000 hectares, including a long coastal swathe in south Tuscany, characterised by low hills, dense, scrub vegetation, and umbrella-shaped Italian stone pine trees. Similarly, the Marshland Refuge of Bolgheri, or Bolgheri Oasis, covers 513 hectares of cultivated fields, meadows, pastures and sand dunes. The Oasis, which is protected by the World Wildlife Fund, is a nesting ground for waterfowl, such as coot, grebe, heron and mallard, and also a staging post for migratory bird species. Luxury camping means not having to cook for yourself, at least not every day, and visitors to Camping Montescudaio can choose from a snack bar serving fast food, such as hamburgers, hot dogs and sandwiches, or a pizzeria and a restaurant, serving a full menu of traditional regional recipes from Tuscany and the Mediterranean in general. The poolside bar serves a wide range of draught beer, wine and soft drinks. The minimarket and tobacconist, which together with the restaurant and bar form the grandly-titled ‘Commercial Centre’ of Camping Montescudaio, sell everyday groceries, including fresh bread, fruit and vegetables, tobacco and foreign newspapers at reasonable prices. Here, as elsewhere on the luxury camping site, the staff are friendly and helpful.